Ken Druck, author of “Courageous Aging,” offers these seven steps to the self care you need. Druck’s book is about how all people can make peace with, and find joy in, every stage of life. Here’s what Druck recommends from an article on Nextavenue.org. Undertaking change of this magnitude and importance takes courage, humility, conviction and a vision of your best possible future. These steps allow you to say “Yes!” to yourself. You have a right to do the things that make life better, easier, less stressful and more joyful and to say “No” to the people and things draining and depleting you. But now it’s time to stop putting yourself and the people you cherish at risk by over committing to things that are not in your best interest. Learning to delegate and share and assign responsibility to others, like any new skill, takes time and practice. You may be unaccustomed to the patience, kindness, encouragement and support you get from others. And you may be unfamiliar with the act of giving yourself permission to turn off the computer and phone and just take a hot bath. Don’t let the old voices of self-criticism, fear and condemnation weaken your resolve, as they once did. Sometimes the best source of wise counsel comes from within. Stop, go to a quiet place, take a deep breath and tune in to yourself. Listen to the inner voice that tells you to “slow down,” “relax” and “take it easy” — the one that gives you the encouragement, strength and guidance you need to take care of yourself in the best way possible. 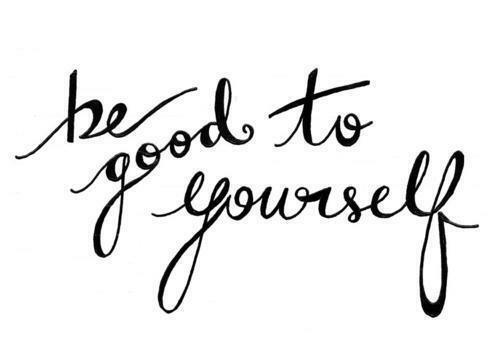 Listening to the kindest, most patient, supportive, forgiving and nurturing parts of yourself is always a good thing when it comes to self-care. So, stay strong. When it comes to taking better care of yourself, every step forward, including baby steps, is worthy of an encouraging, congratulatory pat on the back. You did it! Despite the fear and resistance that comes with change, you are summoning the courage and strength to become the better, more caring version of yourself. This is difficult (inner and outer) work, not to be taken for granted or glossed over. Self-care is your hand resting gently on your heart. Giving yourself your due has nothing to do with selfishness, entitlement, arrogance or taking food out of someone else’s mouth. Self-care is a gift born of a humble gratitude for the life you’ve been given and the person you are. Self-care is a work in progress. So, take every opportunity to implement and improve your master plan.